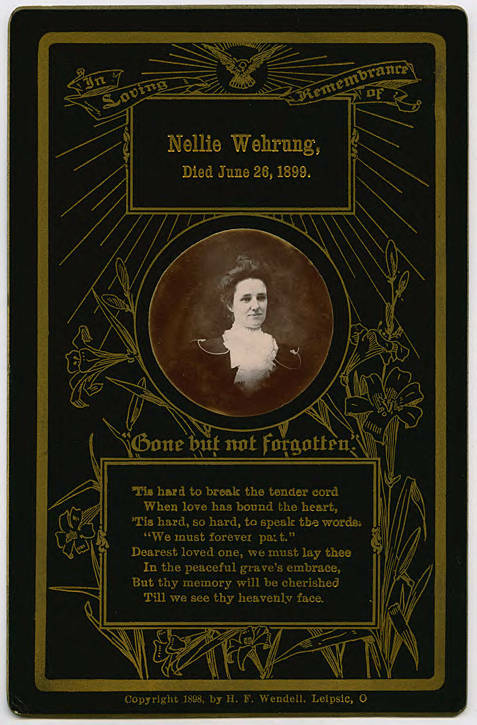 Funeral card with portrait for Nellie Wehrung, who died June 26, 1899. Nellie (Stewart) Wehrung was born in Washington County, Oregon on October 12, 1869, and married G. A. Wehrung on November 4, 1888. [front] In Loving Remembrance of Nellie Wehrung, Died June 26, 1899. 'Gone but not forgotten. '; 'Tis hard to break the tender cord/When love has bound the heart,/'Tis hard, so hard, to speak the words,/'We must forever part. '/Dearest loved one, we must lay thee/In the peaceful grave's embrace,/But they memory will be cherished/Till we see thy heavenly face.